GCX3 GNSS integrated receiver. Photo source: Sokkia. 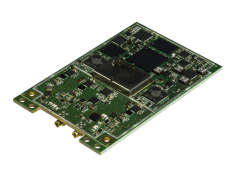 Livermore, California-based Sokkia has introduced the latest addition to its GCX line of GNSS integrated receivers — the GCX3 — featuring advanced constellation tracking, open format software compatibility, and longer range base-to-rover communication. The receiver features radio-free real-time kinematic (RTK) operation via multi-channel, long-range Bluetooth technology. When used as a base station, one GCX3 may support up to three concurrent rovers at a range of more than 300 meters. Each receiver may be used as a base or as a rover. “It also functions as an ideal precision network rover when combined with a cellular-enabled field controller,” said Rihner. The GCX3 dual frequency GNSS receiver is designed to deliver RTK centimeter level performance, offer high-quality results in the surveying and construction fields, and is versatile enough to be used in a wide variety of other areas and industries, according to the company. The receiver features 226 optimized satellite tracking channels, and the dimensions of the rugged, cable-free design are: 47 millimeters wide, 197 millimeters high and 47 millimeters long.